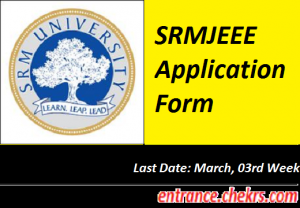 SRMJEEE Application Form (एसआरएमजेईईई आवेदन फॉर्म) 2017: SRM Joint Engineering Entrance Exam is conducted by SRM University for undergraduate applicants admission into its classroom engineering programs. Every year a large number of applicants appear in this entrance examination. Applicants will be able to register themselves by submitting the SRM Joint Engineering Entrance Exam Application Form 2017 by following the steps given below until the last date, i.e. 03rd week of March 2017. There are approx 7000 seats available for the undergraduate engineering applicants and they have four campuses – Kattankulathur, Ramapuram, Ramapuram Part Vadapalani and NCR Ghaziabad. Applicants will get admission in the SRM University on the Basis of the marks obtained in the SRM Joint Engineering Entrance Examination. It is compulsory to fill the SRMJEEE Online Application Form to register themselves for participating in the SRM University admission process. Applicants who fill the application form for Joint Engineering Entrance Exam (JEEE) they can refer the following dates while applying for admission process. Following are the SRMJEEE 2017 Exam Dates. It is mandatory to register them for participating in the entrance exam. Candidates will be able to register themselves by submitting the SRMJEEE Application Form 2017 by following the step wise procedure below on or before the last date, i.e. 03rd week of March 2017. After the successful submission of online applications, selected candidates will be called to appear in the SRM Joint Engineering Entrance Exam that will be conducted on 12th May 2017. Candidates need to open official site of SRM University, i.e. srmuniv.ac.in/. Now click on the registration link after visiting the notification section. Enter all the necessary details in the registration form. Pay the application fees before the due date. Take a print out of application form and submit the form. SRMJEEE is an online exam for taking admission into undergraduate programs in B.Tech (Biotechnology, Bioinformatics, Biomedical, Genetic engineering) that are offered by SRM University. The SRMJEEE Application Form 2017 submission will be started in November and the online applications will be accepted until the 03rd week of March 2017. Every year the SRM Joint Engineering Entrance Exam (JEEE) is conducted for admission purpose in SRM University. Only the candidates meeting the eligibility norms in all the aspects are invited to register for SRMJEEE. After the successful online application submission, the selected candidates will be called to appear in the entrance exam on 12th May 2017. For any type of queries, while submitting the SRMJEEE Application Form 2017, you are invited to contact us by leaving your issues at the end of the post.